Hon. 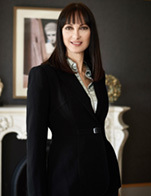 Elena Kountoura is the acting Minister of Tourism of the Hellenic Republic since January 2015. A former eminent member of the Greek National Track & Field Team, she holds numerous national records, and international distinctions and awards. She has a degree in Sports / University of Athens and speaks English, French and Spanish. Elected six times as member of the Hellenic Parliament, in the 2012 and 2015 national elections she was elected in the first position of the "ANEL" ballot in Athens. During that period, she was Secretary of the Movement's Parliamentary Group, was assigned with the overview of Tourism Affairs and she was a member of the Greek Parliamentary Delegation to the Parliamentary Assembly of the Council of Europe (member of the Committee on Migration, Refugees and Displaced Persons and alternate member of the Committee on Equality and Non-Discrimination). As the Minister for Tourism, her international efforts have focused on empowering Greece's global standing in the travel, tourism and hospitality industry, having achieved unprecedented tourism growth and historical records in all tourism figures. For the past 4years Minister Kountoura has participated in several international travel shows and exhibitions, fora and meetings of the global travel industry promoting Greece as a 365-day destination, networking, new strategic partnerships and investment opportunities in the dynamic Greek tourism sector. President of the "EUROPA DONNA HELLAS" foundation, Minister Kountoura also actively supports many international and Greek non-profit organizations, such as UNESCO, UNICEF, Kivotos tou Kosmou, the Panathinaiki Women's Union, Frontida, the Panhellenic Association of Cancer Volunteers, for a range of issues related to health, the environment, women's and children's rights, and for combating domestic violence. She has been honored for her support in spreading the values of Paralympic Volunteerism in Greece, and in 2007she was honored by the Greek Government as a Goodwill Ambassador for Social Volunteering.